You will be received at the airport for the commencement of your tour. You are directly taken to the hotel and the check in formalities is dealt with. Kathmandu is the cultural and political nucleus of Nepal and its capital. After checking in, you can spend the rest of the time at leisure, in the comfort of the hotel. Later you can retire, anticipating for the next day. In the morning, you visit the Pashupatinath temple which is considered very sacred and presents the Hindu culture in Nepal. You will get to see the Hindu saddhus praying and cremate along the banks of the River Baghmati. You then proceed to Bouddhanath, one of the blessed shrines for the Buddhists in Nepal. Many Buddhists make a pilgrimage to this spot. You then leave for Patan or Lalitpur, this region is separated from Kathmandu by the Bahmati river and is more beautiful. 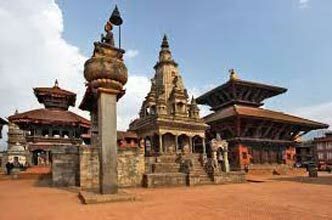 Lalitpur is distinct from the other parts of Nepal for its intricate architectural structures, the central square of Durbar consists of numerous temples, each made with elaborate designs. Within Patan, you come across a settlement area of the Tibetan refugees but they are wealthy merchants of the carpet industry. The carpets are colorful and detailed and also durable. 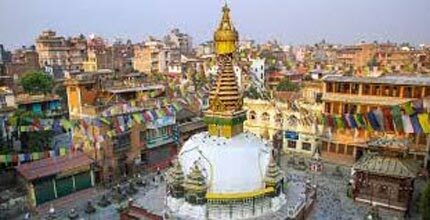 The other attraction you visit is the Swayambhunath, an ancient religious complex located on top of a hill. 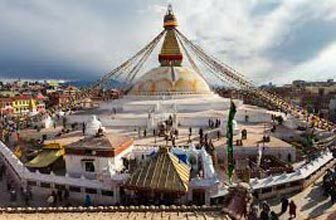 It is prominent with its dome structure and a golden spire, adorned with colorful prayer flags and preset a striking view of the city. Swayambhunath is one of the most interesting features of Nepal, for the eyes that are painted on the edifice seems like it is watching you all the time. Your hectic day comes to an end with your return to the hotel, stay over at the hotel. You head towards Nagarkot which is one and a half hours drive away east of the city. The main characteristic of the place is its location, of 2,174 meters and offers a magnificent view of the ranges including the Mt Everest. On the way up to Nagarkot, you stop by Bhaktapur, it seems like the city is still stuck in the medieval era. The traditional handicrafts are practiced here, it is home to ancient constructions like the Golden Gate, Palace of fifty five windows and temples. You halt the night at Nagarkot, hotel as the day ends. In the morning you get up and check out of the hotel and drive to the airport to catch your flight, continuing your journey.